Just in time for the upcoming grouse season! Here are three great 20 gauges. They’re all up for auction, and they’re all good deals. Markings: The left side of the left barrel is marked “”BROWNING ARMS COMPANY MORGAN, UTAH & MONTREAL P.Q. / MADE IN JAPAN AND ASSEMBLED IN KOREA” and the right side of the right barrel is marked “B-S/S SPECIAL STEEL 20 GA. SHELLS – 2 ¾” AND 3””. Choke: The left barrel is choked Full and the right barrel is choked Modified. Stock Configuration & Condition: The LOP measures 14 1/8″ from the front of the trigger to the back of the 1″ White Line rubber recoil pad. The stocks rate in about Good to Very Good overall condition. Bore Condition: The bore is bright with scattered pits and erosion. None of these threaten the ability of this gun to shoot and none compromise safe barrel wall thickness. 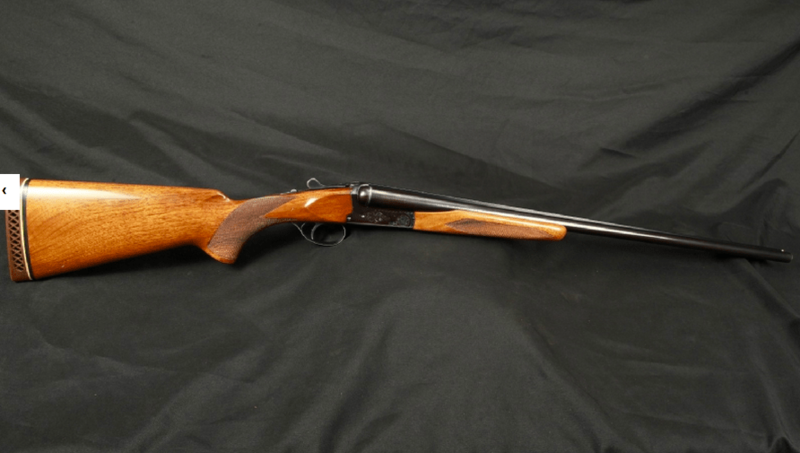 Overall Condition: This shotgun retains about 65% of its metal finish. The balance of the finish shows thinning on the underside of the frame and the lower tang. The barrel at the chambers shows patches of finish loss as well. The remaining finish has begun to turn a plum color. 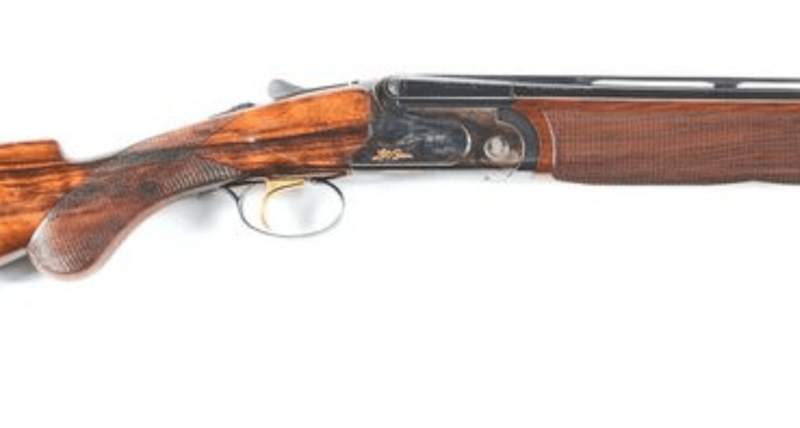 This is a well used but still very functional and even attractive shotgun which is in the kind of condition where you wouldn’t mind taking this gun into the field and letting it earn a few more marks. The screw heads are serviceable but a bit worn. The markings are clear. Overall, this shotgun rates in about Good to Very Good condition. Mechanics: The action functions correctly and while the gun opens easily, there is no play once closed and with the forearm mounted. We have not fired this shotgun. Barrel Length: The barrels are 28” in length with a full length solid rib. Choke: This shotgun is equipped with screw-in “MobilChokes”. Both chokes are marked “PB-IC-SP ****”, or Improved Cylinder. Sights / Optics: This shotgun is mounted with a small silver bead at the front of the solid rib. The rear sight is a shallow “U” groove in the top of the rib. Stock Configuration & Condition: The stocks are checkered walnut with a pistol grip, blued steel grip cap and a thin black solid rubber recoil pad marked on the rear surface with a “P. Beretta” logo. Type of Finish: The barrels and receiver have a black matte finish. The forend tip is blued. Overall Condition: This shotgun retains about 99% of its metal finish. Mechanics: The action functions correctly. The trigger selector button is at the top of the safety. We have not fired this shotgun. 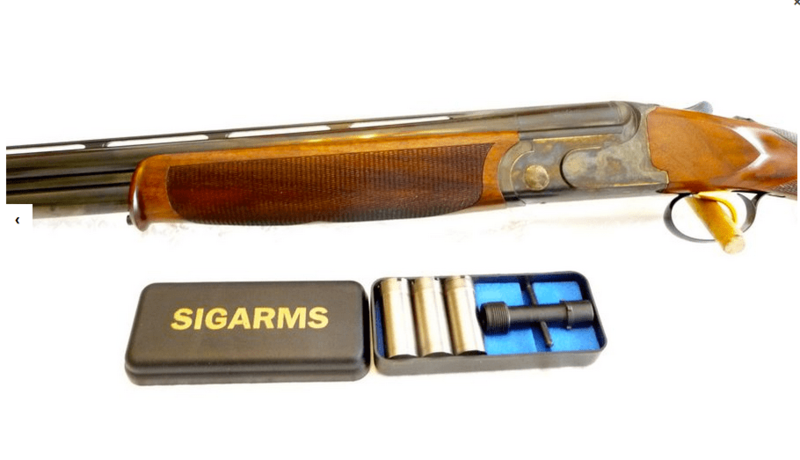 Box, Paperwork & Accessories: This shotgun comes with its original factory cardboard box. 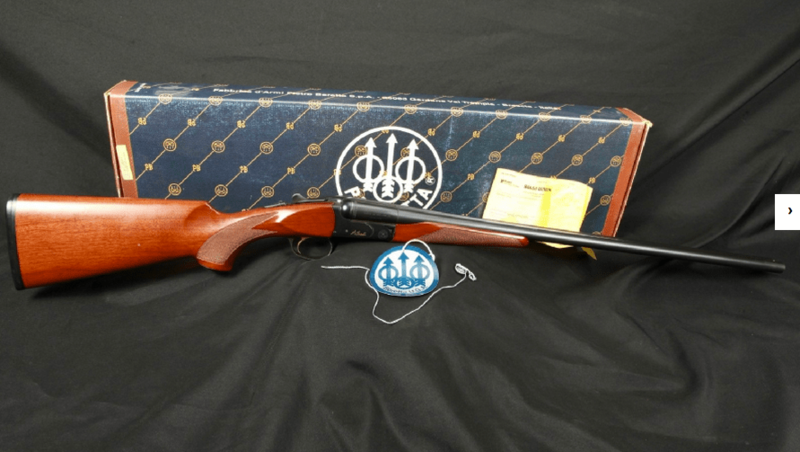 Sigarms/ B.Rizzini Model TR-20 U: Sigarms Model Aurora TR-20U 12 gauge over & under shotgun, English stock, 14 3/4″ pull to 1/2″ pad. 28″ vent-rib barrels with choke tubes. 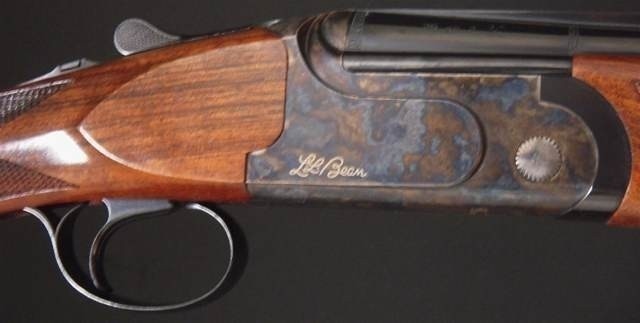 Case colored receiver. Gold SST Schnabel fore-end, deluxe checkering, ejectors. 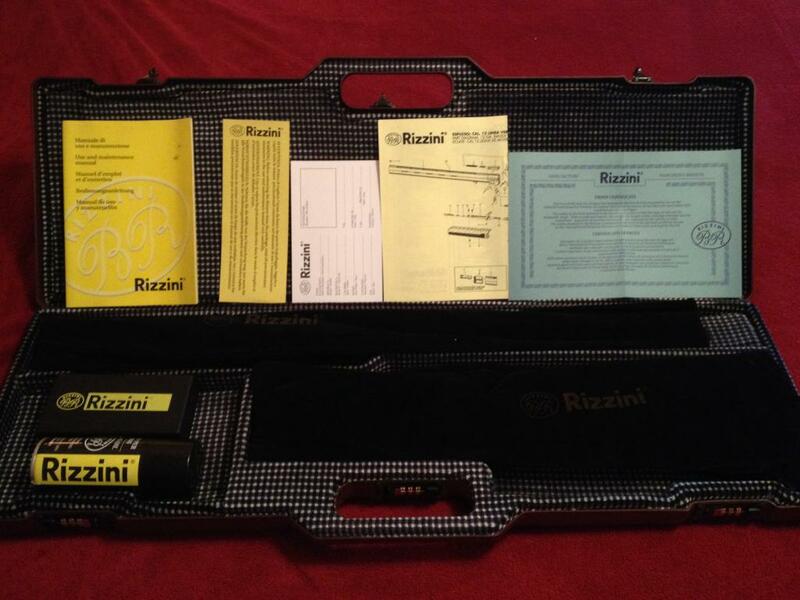 Manufactured by B. Rizzini, Italy. This gun has not been fired very much and is in excellent condition. Here’s a great deal on a fantastic over-under. This gun was made in the early 2000s by Battista Rizzini for Sig Arms. It’s built on a proven action, and the single trigger is as reliable as any out there. With a straight grip, 28″ barrels, and choke tubes, it’s one gun that do it all. 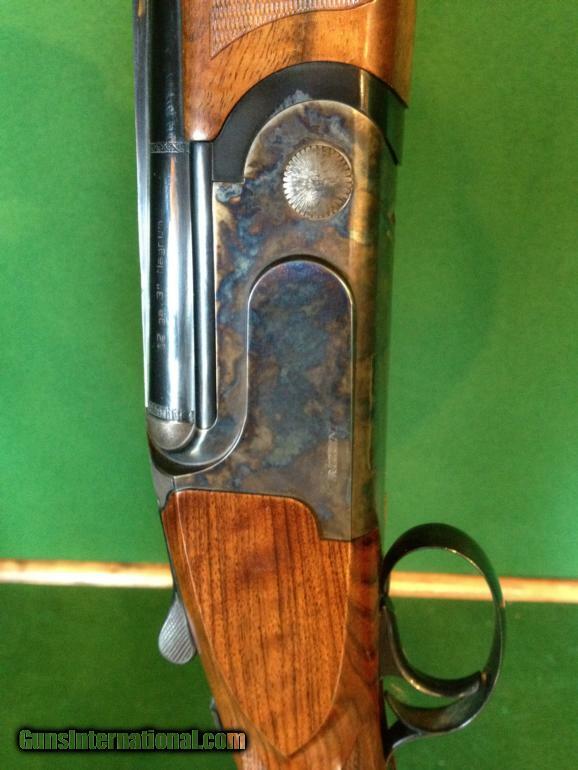 This is a beautifully handling 20 gauge over/under on a true 20 ga frame built by B. Rizzini for Sig Arms. 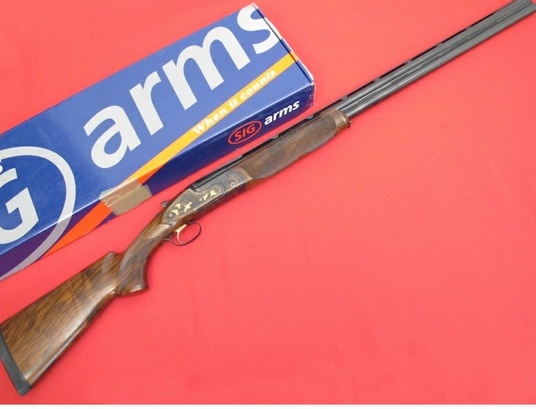 This nice Sigarms Aurora 20 gauge shotgun is on Gunbroker.com right now. 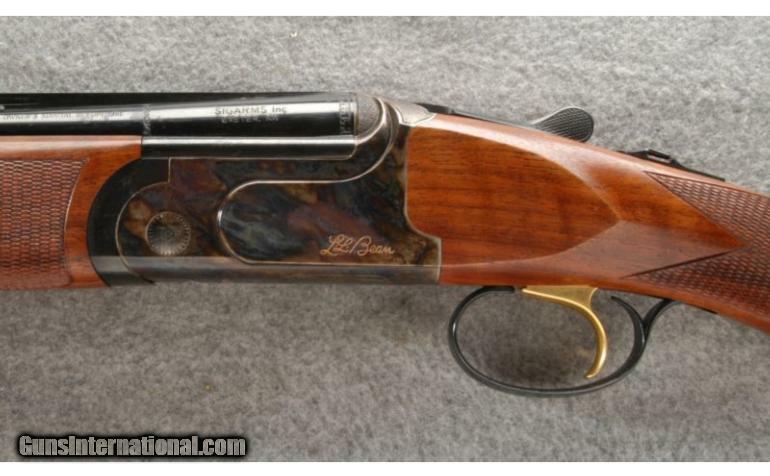 Sig had these double barrel shotguns made for them by B. Rizzini about a decade ago. They were good deals back then and they’re great deals now. 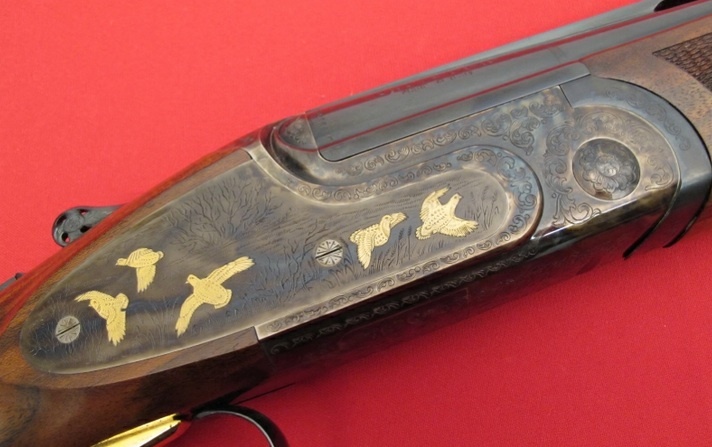 If your looking for a grouse and woodcock gun, this one would be hard to beat. 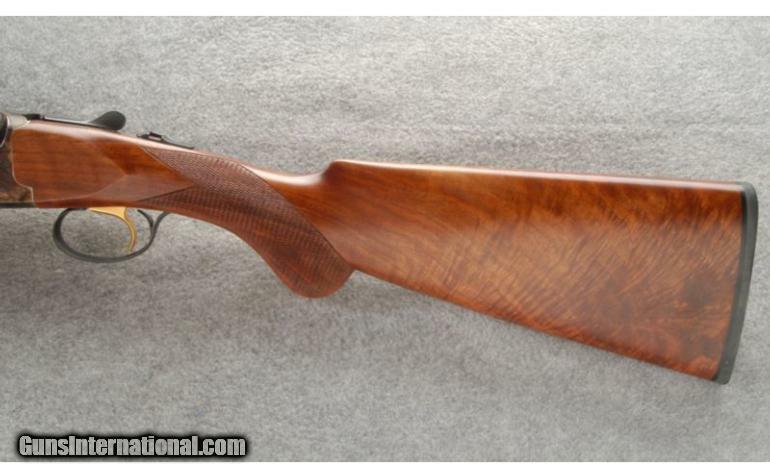 Here’s another good double barrel shotgun that’s up for auction: a Sigarms Aurora TT45 12g. This is a NO RESERVE auction and it ends June 10, 2012 17:40:00 PT. These Sigarms Over & Under shotguns were made in Italy by B. Rizzini and the ones I’ve seen has been a solid, dependable guns. 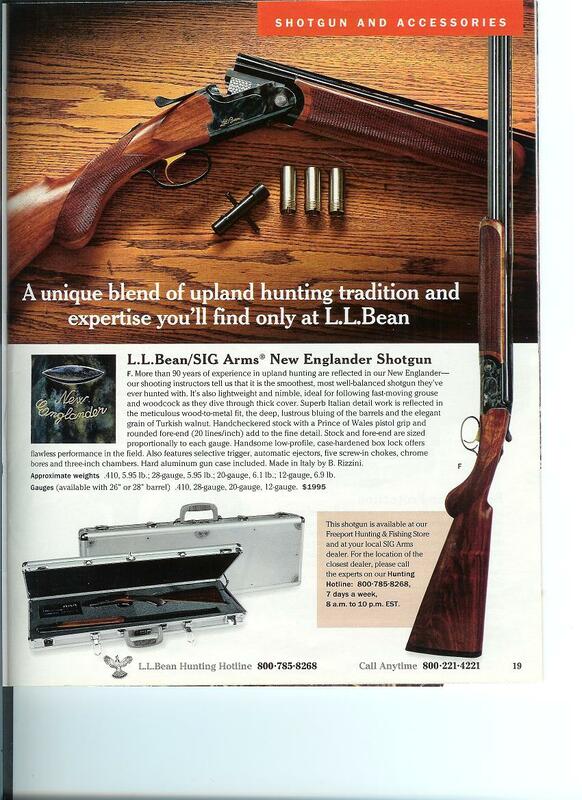 With 32″ bbls, this one looks like it would be ideal for targets. The going retail price on these today is $2000+. With some luck, you may be able to get this for quite a bit less.